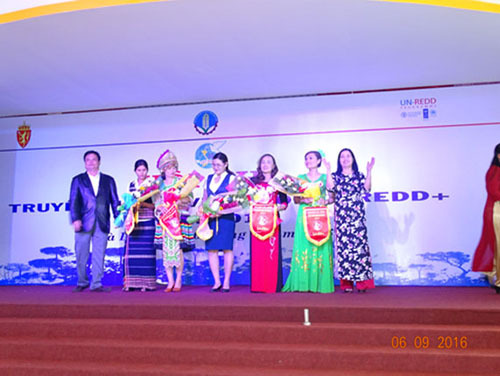 On September 6th 2016, at Hall of Convalescent 198, Da Lat City, UN-REDD+ Lam Dong PPMU cooperated with Women Union to celebrate competition on “Good REDD+ Communicator 2016” for women members from 5 districts Lac Duong, Lam Ha, Dam Rong and Da Huoai. 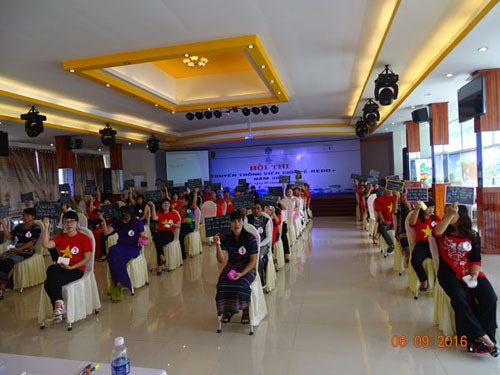 This was not only a play-ground but also a way to propaganda for women from 5 districts in specific and for women in Lam Dong in general to know about REDD+, climate change and UN-REDD+ Vietnam phase II program. 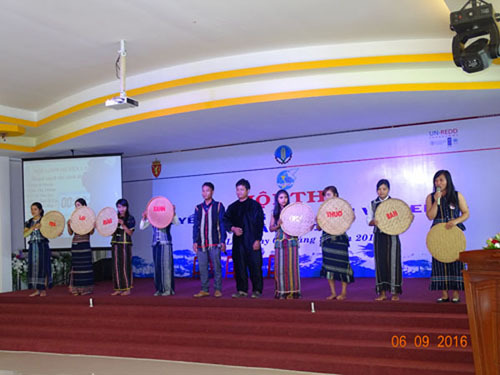 This competition contributed to raise up awareness of communication members and helped them to understand about the program, then they take part in some specific activities that contribute to success of program implementation in Lam Dong. In order to have today’s competition, all the members of all teams have proactively studied from documents and reality in the local, then create the role play and kept practicing in 3 months. Although the competitor- teams came from very long distance to the competition, some had to travel 170 km to attend since very early. The atmosphere was boisterous at the front hall with banners, slogans for the competition, together with the traditional customs of kinh, K’Ho, Ma, Dao, H’Mong and Thai. Those made every body excited and eager about results of competition. 2. Understanding about UN-REDD+, REDD+ and climate change: This part attracted attention and focus from the beginning. Each team had 10 members to compete, they had to provide the quick answer for multiple choice questions (Ring Gold Bell) in limited time. There were 3 levels of difficulty in this part. The competitors could answer well even they had only 3 months for studying. 90% got correct answers. 3. Role-play: This was the funniest part, 05 teams brought 05 role-plays. The show was diverse in content and customs. That showed the well preparation of competing teams. Each play was a moving story about human behavior which is affecting negatively to forest, environment and species. The plays ended with messages such as “Together we protect environment”, “responsibility is not individual”, “to be late is better than never”, “awake”. Integrating in between the competion parts, the music show and questions for audiences with gifts were organized which contribute to activate and make the competition become more excited. The big hands were give again and again sometimes disrupted the competition. Competition judgers enjoyed working and at the end of the competition, judge representative announced: “you all are winners. You will bring back your knowledge, information about climate change, REDD+ and forest management and protection to propagandize, propagate to officers, Union members at site level. This is a very meaningful award”. 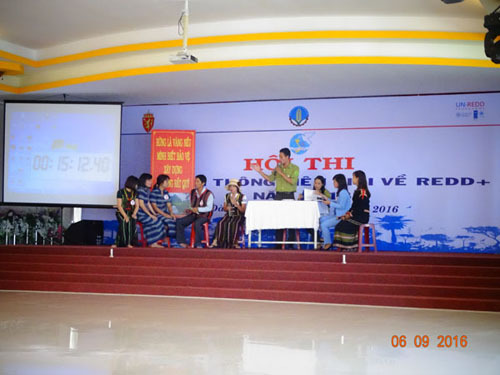 After a day of competition, first prize was belong to Dam Rong Team, second prize was belong to Lam Ha team, third prize was belong to Da Huoai team, Lac Duong team and Bao Lam team got consolation prize, best introduction prize was belong to Lac Duong team and the best role play prize was belong to Lam Ha team. The Good REDD+ Communicators competition has successed and left its good impression in audiences. Contributing to this success, beside effort of PPMU, Provincial and districts’ Women Union, there were the big encouragement from hundreds of supporters from the districts, units in the city who had come and cheer the whole day long for the competition. The competition was the useful tool of UN-REDD+ on REDD+ in the province, contribute indirectly to reducing GHG emission from deforestation and forest degradation, sustainable forest natural resources management, reserve and enhance forest carbon stock to cope with nowadays extreme climate change. The competition’s form needs to be expanded to overall 11 districts, towns and cities of Lam Dong.